March 06, 2019, 5:00 p.m. When it comes to shifts in consumer sentiment, Nike has had quite a month. 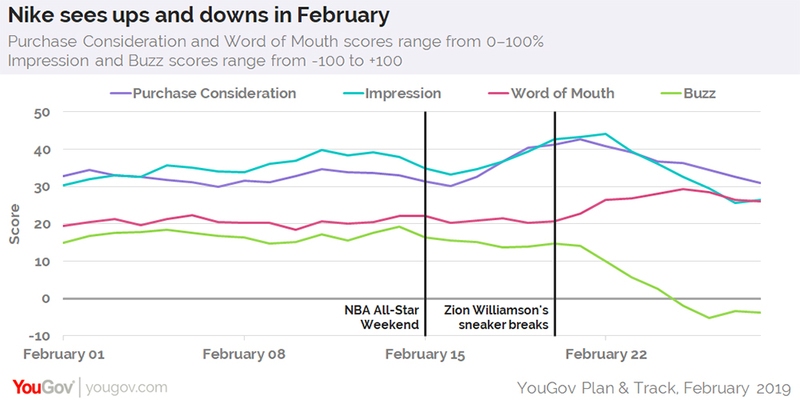 According to new data from YouGov Plan & Track, Nike’s Impression score — which asks US adults if they have an overall positive or negative impression of a particular brand — began rising to a high of +44 around NBA All-Star Weekend, which ran February 15-17. During the various events and competitions, several of the league’s top players were seen wearing Nike sneakers, and the Nike-sponsored Kevin Durant ended up winning MVP of the All-Star Game, scoring a team-high 31 points. The number of consumers open to purchasing their next footwear or apparel item from Nike also climbed to a high for the month following NBA All-Star Weekend. On February 15, 31% of US adults expressed interest in buying the brand. Nearly a week later, however, that percentage had increased to 43%. Following the mishap, Nike’s Buzz score — which asks US adults if they’ve heard something positive or negative about a particular brand in the past two weeks — decreased from +15 to -5, as the number of consumers talking about Nike with friends and family members rose from 21% to 29%. After Williamson’s shoe fell apart, Nike’s Impression and Purchase Consideration metrics began declining from their monthly highs. Additional YouGov data shows that 61% of NBA fans have a positive impression of Nike, compared to 54% of NCAA men’s basketball fans and 51% of the general public. In total, 31% of NBA fans say celebrity endorsements can affect their purchase decisions, while the same is true for 29% of NCAA men’s basketball fans and 19% of all US adults. Purchase Consideration asks, "When you are in the market next to purchase clothing, shoes, accessories, or luggage, from which of the following brands would you consider purchasing?" Impression asks, "Overall, of which of the following brands do you have a positive or negative impression?" Word of Mouth asks, "Which of the following brands have you talked about with friends or family members — whether online, in person, or through social media — in the past two weeks?" 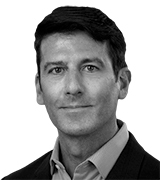 Buzz asks, "If you&apos;ve heard anything about the brand in the past two weeks — through news, advertising, or word of mouth — was it positive or negative?"